Half-Life 3 – you know, the vaporous sequel to one of the most influential shooter franchises of all time – could have been a real-time strategy or even an interactive movie adventure game. What happened to Half-Life 3? Here’s the story (so far) on arguably the most-wanted game ever. “I was actually chasing a story on Half-Life 3, trying to figure out what happened. I talked to one developer who actually gave me legitimate information and told me it was a hot mess. There were so many different prototypes that were small teams – four or five people working on them – that just never got off the ground. Reiner also says “I reached out to ten to fifteen people who worked for the company and they just didn’t want to talk about it all,” including some who were happy to give interviews back nearer the time of Half-Life 2: Episode Two’s release. “Dead end after dead end after dead end,” says Reiner, suggesting Valve – or at least their employees – are getting sick of being pestered. 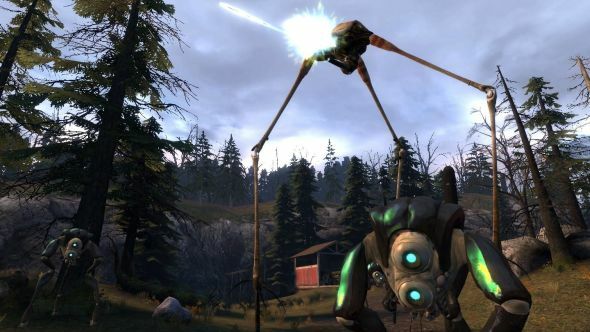 Episode Two was the last official Half-Life game, and it’ll turn ten years old in October this year. The episodic format was intended to shorten the wait (lol) between pieces of content after the six years between Half-Lives 1 and 2. An Episode Three was planned, but has ballooned into a fully-fledged sequel in the years since Episode Two; as this story further proves, Half-Life 3 has been in development at some stage, but we don’t know that it ever got much beyond initial concepting. With Valve doing so well out of Steam, Dota 2 and CS:GO, and having shown no interest of late in major single-player releases, the best advice regarding Half-Life 3 continues to be: don’t get your hopes up. Personally, I honestly wonder whether they have the expertise on staff to make a triple-A single-player shooter, let alone one of the same innovative brilliance of the first two Half-Lives.